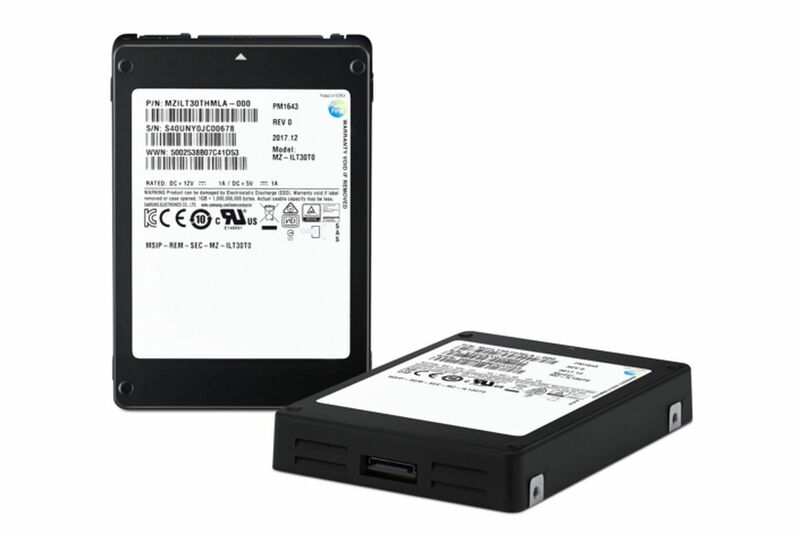 Today Samsung , has unveiled its SSD offering a storage space of 30.72 terabytes, in a format 2.5 inches: the PM1643. It is designed for companies wishing to move away from the mechanical components of their standard hard drives. Last year Kingston announced the release of the world's largest USB drive with 2TB of storage . In 2016, Seagate unveiled a 60 TB SSD, but it was just a prototype. The marketed format is only "15TB". This SSD is composed of 32 1TB strips, containing 16 layers of 512GB V-NAND chips. It can hold more than 5,000 HD movies and offers double the capacity of the previous format: a 16-terabyte disc designed by Samsung in March 2016. Samsung promises 2,100 MB / s read and 1700 MB / s write. The price has not yet been communicated, but do not think you can buy it because the model is not intended for individuals and its price could in all cases be a deterrent! Versions with lower capacities ranging from 800GB to 15.36TB are also available in the Samsung catalog!